Pune 12th September, 2017: Players of Puneri Paltan, one of the top performing teams in Pro Kabaddi League, recently visited the homes of two of their ardent fans and surprised them. After defeating U Mumba in the Maharashtra derby, the Puneri Paltan team were in Pune for some rigorous practice sessions and took some time out of their busy schedule to interact with their beloved fans. Kunal Jadhav and Ninaad Rajput were the two lucky fans selected through a contest run by Puneri Paltan on their social media platforms wherein participants were asked to make a wish to Ganpati Bappa and the ones with the most interesting wishes were chosen as winners. The team enjoys a huge fan following on all their social media platforms and they received overwhelming responses for the contest. Kunal Jadhav, who lives in Chinchwadgaon was visited by the veteran player Dharmaraj Cheralathan and Umesh Mhatre. Kunal was exhilarated when he learnt that he would be visited by two amazing players from Puneri Paltan. 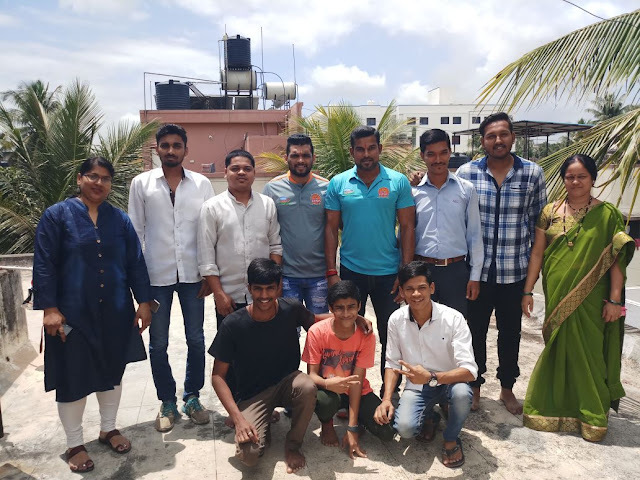 Dharmaraj and Umesh were given a warm welcome by Kunal and his family and they had prepared special Maharashtrian delicacies like Sol Kadhi, Puran Poli and Misal for them. They took many pictures and selfies with Dharmaraj and Umesh. 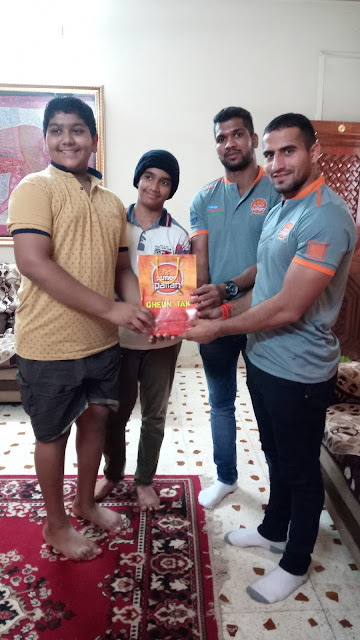 Ninaad Rajput, a die-hard fan of Sandeep Narwal, who resides in Nigdi, Pradhikaran was visited by his favourite player Sandeep Narwal and Gurunath More. Ninaad also invited his best friend Sahil and both of them were extremely glad to meet and interact with Puneri Paltan players. Both the boys are in 8th standard and play kabaddi for their school teams. Both the 14 year olds bombarded the players with questions on Kabaddi, which Sandeep and Gurunath happily answered and also gave few tips to the budding Kabaddi players. Ninaad and Sahil also played a friendly game of Kabaddi with Sandeep and Gurunath.